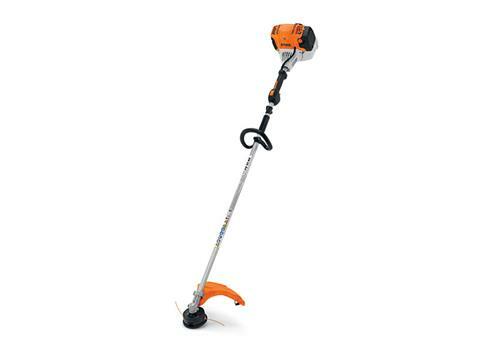 Trim circles around other professional trimmers with the STIHL FS 111 RX trimmer. It provides 30% longer run times than the FS 100 RX to help get to the job quicker. It also saves users time with a simplified three-step start procedure. Through its semi-automatic choke lever and one-touch stop, the FS 111 RX allows users to turn off the engine with the simple press of a button. Thanks to its high-powered and low exhaust emission engine, this straight, hollow steel shaft trimmer is dependable and practical. Additionally, its loop handle makes for excellent maneuverability around landscaping obstacles. The FS 111 RX is the perfect choice for professionals with demanding trimming needs. 11.0 lb. (5.0 kg) - Without deflector and cutting attachment.